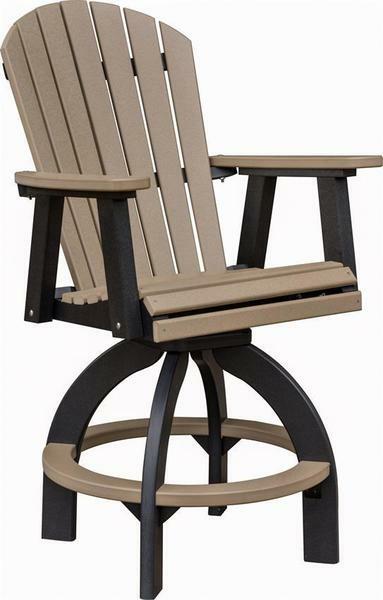 The companion chairs for your Garden Rose Bar Height Table or set up together as a quiet sitting area on your patio, our Amish Poly Comfo-Back Swivel Bar Stools are a great way to relax with loved ones and enjoy a meal and drinks outdoors. Pick the perfect poly color and add an optional Sunbrella cushion and throw pillow for the perfect bar chairs to craft your unique, dream outdoor seating area. The smooth contoured seat and gripping backrest design make these bar chairs so comfy, that even DutchCrafters founders Jim and Linse Miller couldn't resist purchasing a set for their home. And as you can see from our photos, it makes for the perfect place to kick back with family and friends (or co-workers) and enjoy ever outdoor moment! Each Comfo-Back Swivel Bar Stool is handcrafted by skilled Amish woodworkers, with the utmost attention to detail. With the use of high quality, eco-friendly poly lumber, you can enjoy decades of carefree, maintenance free relaxation in your new chairs. Seat Height - 26 1/2"
Backrest Height - 27 1/2"
Base Width - 28 1/2"